China’s focus on countering a U.S. military intervention along its periphery is alive and well. In a recent article in The Washington Quarterly, two well-respected scholars of Chinese military affairs seek to debunk the idea that the People’s Liberation Army (PLA) has been designing its modernization drive and strategic planning around the concept of “counter-intervention,” which refers to the ability to force an outside power to stand off from the Chinese mainland and its immediate periphery during a conflict. Their assessment is based on a meticulous review of Chinese military texts, which the great majority of Western defense analysts will find difficult to dispute and which imbues their work with an air of scholarly authority, even where their judgments stray beyond what is warranted by their careful review of the language involved. The article has made quite a splash, with The Diplomat’s Franz-Stefan Gady going so far as to call it “The One Article to Read on Chinese Naval Strategy in 2015.” I have to disagree with this assessment. This is not to say that those interested in China’s military modernization can afford to gloss over Fravel and Twomey’s article – they cannot, and should not. It is an important corrective provided by two leading scholars and, as such, should induce us to adapt the vocabulary we rely on in describing Chinese military planning vis-à-vis the United States. But don’t stop reading just yet, and don’t fall into the strange constructivist trap of believing that a strategy suddenly ceases to exist because the language we used to describe it is shown not to be in widespread use among its makers. In establishing this latter fact, Fravel and Twomey succeed beyond reasonable doubt: The idea that “counter-intervention” is the genuinely Chinese equivalent to the Western concept of anti-access/area-denial (A2/AD) is not supported by the available evidence, period. The authors deserve credit for exposing this fallacy, and unless new material is uncovered that strongly points in a different direction, serious analysts should refrain from attributing the term “counter-intervention” to the PLA or other participants in the Chinese doctrinal debate. While I see no compelling factual grounds for discarding the construct altogether, its troubled history of association with Chinese sources should be reason enough to retire it. Given the PLA’s focus on defending China’s maritime periphery against both regional and extra-regional actors seeking to intervene in its perceived spheres of vital interest, the concept of “peripheral defense” would seem to me to offer an adequate alternative description of the Chinese approach to anti-access warfare. While I may or may not be taken up on this suggestion, a replacement is, in fact, required. For when it comes to characterizing the actual content of Chinese military strategy and operational paradigms, Fravel and Twomey find themselves on much shakier ground. 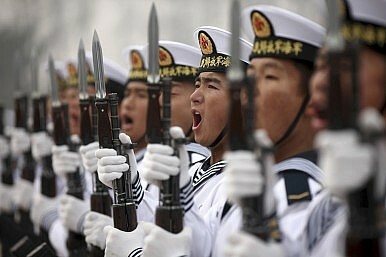 Spurred by their compelling refutation of the relevance of “counter-intervention” as a concept in current use by PLA planners to describe their overall operational and strategic frameworks, they begin to equate this with a refutation of the substance of the “counter-intervention” paradigm as an important element of PLA doctrine and plans. This is a much more problematic endeavor, and one in which the authors seriously overstretch their very valid initial findings. By way of analogy, the United States’ national military strategy could be accurately described as “global forward defense.” Now try finding this phrase in authoritative Department of Defense documents, such as the 2011 National Military Strategy, the 2012 Defense Strategic Guidance, the 2014 Quadrennial Defense Review, or the Capstone Concept for Joint Operations. Unless I am seriously mistaken, the number of hits you get will be exactly zero. You will, however, find many direct and indirect corollaries of such an approach, which reflect the “deep assumptions” held by the U.S. defense establishment about how, where, alongside whom, and against whom its forces will have to fight. Similarly, a comprehensive assessment of China’s national military strategy would have to allow for the fact that ‘counter-intervention’ may very well be present in spirit, even where it fails to manifest itself in the specific language preferred by military planners. Instead of conceding this possibility and acknowledging the many corollaries of a “counter-intervention” approach that have been documented elsewhere (for example here, here, and here), Fravel and Twomey claim that U.S. analysts are grafting onto the PLA a paradigm of anti-access warfare that describes what the Soviet Union did during the Cold War, and that is now being applied to China in a “mistaken analogy.” Yet, if they had gone to the trouble of reviewing authoritative treatments of Soviet naval and air doctrine, they would have found very little in the way of explicit A2/AD language in those documents, either. In fact, the Soviet military couched its concepts for anti-carrier warfare almost exclusively in terms of defense of the homeland from nuclear attack, and placed it second in importance to strategic anti-submarine warfare from the early 1960s onwards. The much-feared sea denial function of the Soviet submarine fleet was also ranked rather low among the priorities of the Soviet Navy in most of its official documents – certainly much lower than in NATO’s threat perceptions. As for vague statements about a “blue belt of defense,” the phrase remains as evocative as ever – but we still do not know what exactly the Soviets were getting at, even half a century after the fact. Does this prove that the Soviet Union did not, in fact, pursue a strategy that could be meaningfully understood in anti-access or “counter-intervention” terms, that Western threat perceptions in this regard were baseless, and that there was no need to improve NATO’s sea control capabilities? Well, not exactly. As Fravel and Twomey are undoubtedly well aware, military organizations that embody different strategic and military cultures diverge widely in how they organize the substance of what they plan to do – or expect others to do – into doctrinal precepts and language, and may end up bundling concepts and proposed activities together in ways that other actors would not. China’s peripheral defense strategy is an excellent example of this. While U.S. analysts tend to think about PLA doctrinal constructs that relate to countering outside military intervention as a single paradigm, made up of everything they perceive as particularly threatening, the PLA itself seems to have parceled them out across several of its generic framework campaigns, including the Joint Firepower Attack and Joint Air Defense campaigns. As a result, U.S. observers may, in fact, overestimate the coherence of the PLA’s approach. But by restricting themselves to explicit mentions of “counter-intervention” and discounting aspects of the PLA’s doctrine that are subsumed under different headwords, but by any reasonable standard contribute to “counter-intervention” in substance, Fravel and Twomey almost certainly underestimate the factual prominence of A2/AD-like precepts in Chinese military planning. In fact, they themselves mention the Joint Firepower Attack and Joint Air Defense campaigns, which have long been seen by other experts as providing the building blocks for a “counter-intervention” strategy, as being central elements of PLA operational doctrine. Finally, while they cannot dispute that the PLA is acquiring capabilities that are useful for, or even exclusively geared towards, peripheral defense, Fravel and Twomey argue that the focus on “counter-intervention” may distract analysts from identifying more relevant trends pointing towards a future focus on regional power projection. They mention, inter alia, the fact that production of the Type 022 fast attack craft was foregone in favor of Type 056 corvettes after 2009 (even though it is not entirely clear that Type 022 production has ceased for good). But why the addition of longer-range systems – the maximum range of the Type 022 is thought to be around 400 nautical miles and its maximum endurance does not greatly exceed 24 hours – should be incompatible with “counter-intervention” is not immediately apparent. With a 3,500 mile range and a maximum endurance of perhaps three weeks, the Type 056 will not usually reach far beyond the area covered by the DF-21D anti-ship ballistic missile. In fact, the defining feature of a fully-fledged Chinese anti-access system would probably be defense-in-depth beginning at, or beyond, the Second Island Chain, which would require even longer-range systems. This is not to say, of course, that surface combatants like the Type 056 and Type 052, or nuclear-powered attack submarines like the Type 093, are an investment in a strategy and operational paradigm that is exclusively focused on “counter-intervention.” These are inherently multi-purpose capabilities, and some of them may well be designed with an eye towards regional sea control vis-à-vis China’s smaller neighbors. But this does not, in any way, detract from their usefulness in scenarios in which the PLA Navy would face the superior U.S. Navy, or the Japan Maritime Self-Defense Force, and seek to keep it out of China’s maritime environs. In such scenarios, “counter-intervention” and the ability to project naval and air power beyond the littoral are very much the same thing. Overall, then, the fact that the “counter-intervention” concept does not figure prominently in the Chinese debate does not mean that China’s strategic priorities in planning for a conflict that might involve the United States cannot be meaningfully described in these, or similar, terms. By applying an overly restrictive criterion focused on the language of “counter-intervention,” Fravel and Twomey minimize the scope and significance of China’s anti-access efforts, which – as far as we can tell – are a real and enduring component of the PLA’s strategy for high- and medium-intensity conflicts along its maritime periphery, and which figure prominently in the operational approaches it is planning to rely on in such scenarios. In revealing the non-Chinese origins of the “counter-intervention” concept, Fravel and Twomey have done the scholarly and policy communities an undisputed favor. Their attempt at putting some of the more threatening elements of China’s military modernization into perspective by deconstructing the language surrounding them is also commendable and well-intentioned. But when seeking to uncover the actual components of strategy, the literal interpretation of officially sanctioned texts may tell only half the story. Michael Carl Haas is researcher with the Global Security team at the Center for Security Studies, ETH Zurich. His interests include air/missile and sea power, the proliferation of advanced conventional weapons, and U.S. grand strategy. Anatomy of a Taiwan Invasion: The Air DomainWhere Are the Chinese People's Liberation Army's Guided Bombs?The Mysterious Death of a Chinese GeneralChina's Americanized MilitaryWhat Happens After China Invades Taiwan?